November 12, 2015 – An atmospheric haze around a faraway planet — like the one which probably shrouded and cooled the young Earth — could show that the world is potentially habitable, or even be a sign of life itself. The work builds on geological and scientific data from other researchers, including scientists from the University of Colorado Boulder, that suggests the early Earth was intermittently shrouded by an organic pale orange haze that came from light breaking down methane molecules in the atmosphere into more complex hydrocarbons, organic compounds of hydrogen and carbon. Arney and co-authors presented their findings this week at the American Astronomical Society’s Division of Planetary Sciences conference in National Harbor, Maryland. The theory of early Earth being shrouded by a gaseous blanket containing methane and ammonia first arose in the 1960s and was subsequently discarded by scientists. In the 1970s and 1980s some scientists suggested the early Earth atmosphere was similar to those on Mars and Venus with lots of carbon dioxide, another theory that eventually went by the wayside. Since CO2-rich atmospheres do not produce organic molecules easily, scientists began looking in deep-sea volcanic vents and at wayward asteroids to explain early Earth life. A 1997 paper by the late Carl Sagan of Cornell University and Christopher Chyba, then at the University of Arizona, proposed that an organic aerosol shield in early Earth’s atmosphere would have protected the ammonia wafting beneath it, allowing heating to occur at Earth’s surface. But the authors proposed the haze particles were spherical and did not consider methane to be the driver of the system, eventually sinking that theory. 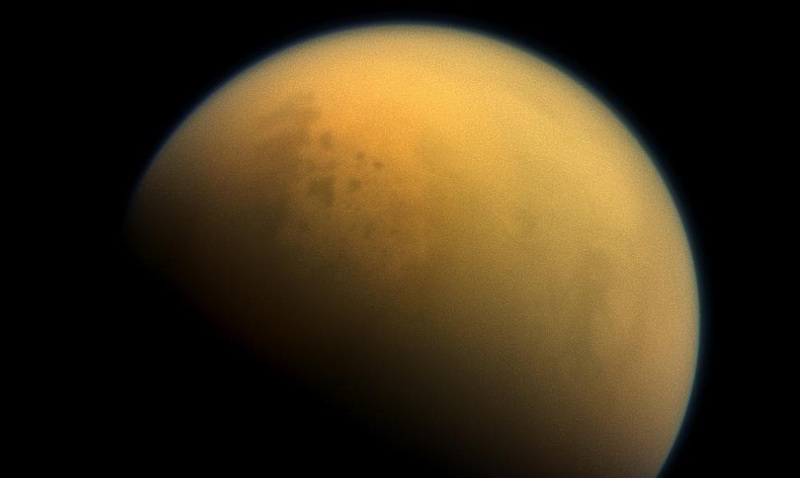 In 2010, a study by then CU-Boulder doctoral student Eric Wolf and Professor Brian Toon of the atmospheric and oceanic sciences department published a study that showed a thick organic haze that enshrouded early Earth several billion years ago may have been similar to the haze now hovering above Saturn’s largest moon, Titan, and would have protected primordial life on the planet from the damaging effects of ultraviolet radiation. The CU Boulder scientists believed the haze was made up primarily of methane and nitrogen chemical byproducts created by reactions with light. Not only would the haze have shielded early Earth from UV light, it would have allowed gases like ammonia to build up, causing greenhouse warming and perhaps helped to prevent the planet from freezing over. The researchers determined the haze of hydrocarbon aerosols was probably made up of fluffy, microscopic particles shaped somewhat like cottonwood tree seeds that would have blocked UV but allowed visible light through to Earth’s surface. CU-Boulder researchers estimated there were roughly 100 million tons of haze produced annually in the atmosphere of early Earth during the Archean. “If this was the case, an early Earth atmosphere literally would have been dripping organic material into the oceans, providing manna from heaven for the earliest life to sustain itself,” Toon said.